Hurt No Living Thing is the latest addition to the stunning Heavenly Quotes collection, a range of shades which in the words of a-england, "draw their inspiration from well known words through the ages". Hurt No Living Thing is a sheer, shimmering mix of pale grey and lilac, and I'd describe it as a top coat because it's at it's best when worn over another shade. The formula is perfection, as you would expect! This is 1 coat of Hurt No Living Thing over 2 coats of a-england Sleeping Palace, with top coat. I tried it over several colours before I chose some to blog about, and it looks by far the prettiest over Sleeping Palace! This is 1 coat of Hurt No Living Thing over 2 coats of Barry M Blue Grape, with top coat. 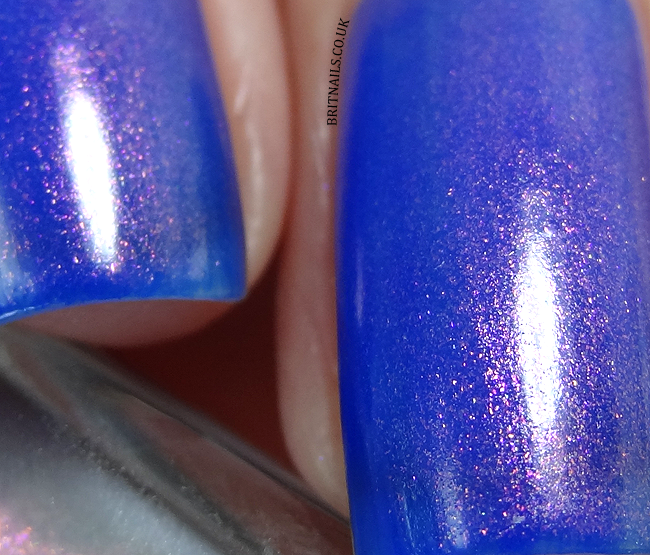 It adds a beautiful subtle lilac shimmer to the deep blue creme. Such a lovely combination! 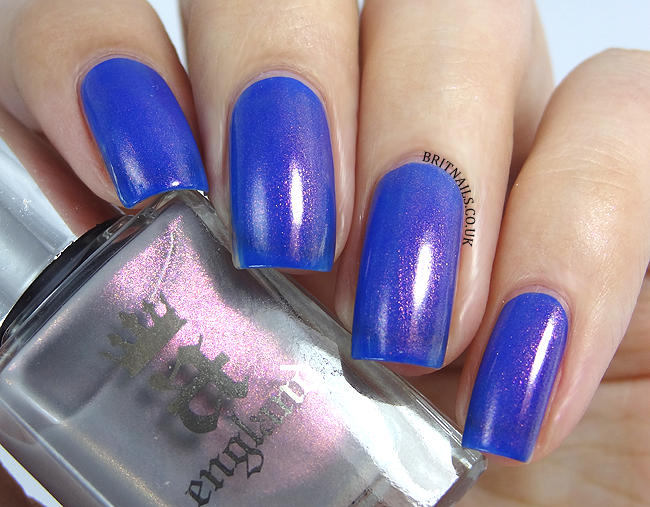 Another beautifully alluring polish from a-england and such a welcome addition to the Heavenly Quotes collection! I had fun trying it over various different colours. If you own this and have found any more nice combinations, be sure to let me know! Hurt No Living Thing is available now from the a-england website, priced £9.00 with free delivery. If you live outside of the UK, check the where to buy page for a list of distributors. It's very subtle and thin, really better as a top coat, I think. Looks great especially over Sleeping Palace in my opinion. Ah, by thin I meant that it isn't much opaque ;) Yet a lovely shimmer. 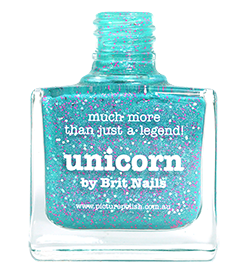 This reminds me a bit of models own Indian Ocean which I love so I might try this at some point as well.